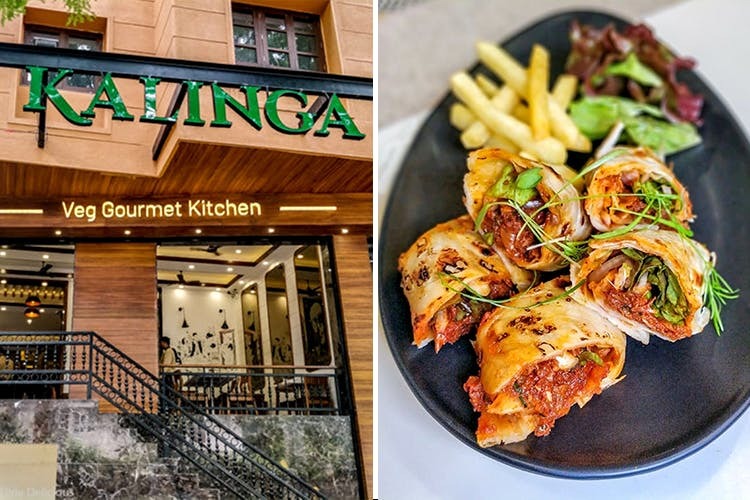 Kalinga Veg Gourmet Kitchen is a new restaurant in Erandwane, spread across 3 floors at the new 'House of Nosh' is just *one* of their new eateries. The extensive all-vegetarian menu has been developed by celebrity Chef Amit Puri, and spans Indian, Pan-Asian, and Continental cuisine. Start your day with a multi-grain dosa, an English muffin sandwich, or banoffee waffles; Kalinga's breakfast menu is available from 8am to 8pm. Their plentiful all-day offerings - street food, salads, 'nibbles', stuffed baos, sandwiches, wraps, hand-rolled pizza, pasta, main course, and dessert - are available from 11am until 11.30pm. From a classic Mulligatawny soup, to an innovative 'multi-grain bhel puri', to peri-peri arbi tuk, pan-seared ravioli, a smoky BBQ cottage cheese pizza with chipotle chillies, and indulgent treats like ice cream falooda and Kalinga's signature kheer - there's something for everyone on this menu. A large amount of the dishes are even Jain-friendly. The diversity and quality of their food is said to be so good, even die-hard meat lovers will be satisfied! The bar at Kalinga (on the 3rd floor) features a stellar list of cocktails and mocktails created by none other than Shatbhi Basu - India's first female bartender. They're launching at the end of August, so keep that in mind too. Here's hoping that House of Nosh will open more outposts in other parts of the city, so we can all get a taste of their food! House of Nosh will be launching more dining options over the coming months - which will also cater to non-vegetarians. Stay tuned for Babylon Grill Room, Level 5 Bistro, and Babylon Brewery - their own craft brewery that promises exciting, experimental beers.